Road Conditions and Attractions160 miles. 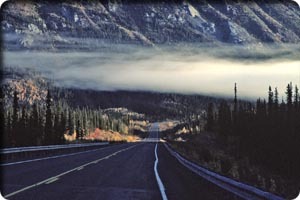 Now paved from the Alaska Highway north to Chicken, the rest is generally good, graded gravel, with tight turns, steep grades, and seasonally poor road conditions. Chicken, Fortymile River system, high ridges, Eagle, Yukon River, Yukon-Charley National Preserve. The Taylor is a hilly, winding, route being paved in stages, now paved from the Alaska Highway to Chicken. The gravel stretch beyond can be dusty, muddy, washboarded, and potholedthough it’s usually pretty good. 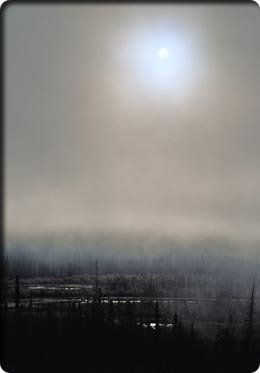 The road was built between 1946 and 1953 to provide access to Eagle and the Yukon River. It is a road to river-runner’s heaven, providing access to 600 miles of national wild and scenic rivers392 in the BLM’s Fortymile River system and 208 in Yukon-Charley National Preserve. The BLM administers much of the historic Fortymile mining region, threaded by the branches of the Fortymile River and its tributaries. About 392 water miles are protected by the wild (192 miles), scenic (208 miles), or recreational (10 miles) designations, offering river runners a variety of options for trip length, scenery, and whitewater challenge. Two of the best routes are: The South Fork Fortymile River route offers Class IClass III waters and is accessible at several points from the Taylor Highway (see milepost listings). From the first put-in at Mile 49, distances to roadside take-outs are about 25 miles to Mosquito Fork, 30 miles to South Fork Lodge near Chicken, 72 miles to Fortymile Bridge (Mile 112.6), and 165 miles to Eagle. There are other take-outs as well, though away from the road the river dips deeply into wild country. Mining activity is heavy in spots, particularly downstream of Chicken. The Middle Fork/North Fork Fortymile River route is accessed by an air drop-off, often at the old mining camp of Joseph. Canyons and mining ruins are found along the 90-mile route to the first roadside take-out at Fortymile Bridge, as are rapids that can reach Class V. The North Fork meets the South several miles upstream of the road take-out at Fortymile Bridge (Mile 112.6 of the Taylor Highway). An alternative or extension is to stay in or put-in at Fortymile Bridge for the loop through Canada to Eagle. It's a 100-mile, weeklong trip through varied country with canyons, the historic site of Fortymile town at the Yukon-Fortymile confluence, and a wind-in-the-face final leg down the wide, silty Yukon to Eagle. Contact the BLM for information on all routes. The Tok office is the best choice, 883-5121. 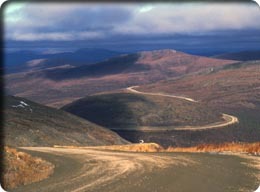 The Taylor is one of only two Alaska highways that closes in the winter. Maintenance ends in mid-October and the first snow of consequence closes the road until April. The Top of the World Highway (also closed in winter) to the border and Dawson City meets the Taylor at Mile 95.7, Jack Wade Junction. Both roads spend time on the ridgecrests, affording magnificent views. Tetlin Junction and Alaska Highway (Mile 0 Taylor Highway, Mile 1,301.7 Alaska Highway)The roadhouse here may be in operation. Get gas if youre low. Mount Fairplay Viewpoint (Mile 35.1)Views of the Alaska Range are possible. The land to the north is the Fortymile Mining District, first worked in 1886. Signs of past and present mining is evident at many spots. West Fork BLM Campground (Mile 49)There are 25 campsites here, as well as the put-in for the West Fork of the Dennison Fork of the Fortymile River (see Fortymile, below). Mosquito Fork Access (Mile 64.3)Put in here to connect with the South Fork Fortymile route (see below). Chicken (Mile 66)This town (population 40 or so) began as a mining camp. It’s rumored that early miners wanted to name their town "Ptarmigan," but couldn’t spell it, so went with the simpler name. Several old structures are visible on private land near the road at about Mile 67. Today there’s an airstrip and some businesses just south of the Taylor on Airport Road (Mile 66.4), including "Beautiful Downtown Chicken Alaska" which offers a cafe, bar, store, and gas. Fill up here if you’re low. You can put-in at Mosquito Fork for the Fortymile route below the airstrip. BLM Chicken Field Office (Mile 68.2)Information is avai-lable here, as is the trailhead for the Mosquito Fork Dredge Trail (3 miles), which leads to an old mining dredge on the river. RT3 hrs. South Fork Bridge (Mile 75.3)Access to South Fork Fortymile route. Walker Fork BLM Campground (Mile 82.1)16 sites. Jack Wade Number 1 Dredge (Mile 86.1)Enjoy this picturesque old gold dredge east of the road. Jack Wade Junction and Top of the World Highway (Mile 95.7)Head right along the ridge 11 miles to Canada and 68 more to the free Yukon ferry at Dawson City. The Top of the World Highway is a beautiful ridgetop gravel route with stellar views. The road is generally good but, like the Taylor, can be slippery, dusty, or rough. Stop at the Boundary Inc. roadhouse about halfway to the border for gas, food, lodging, gifts, or tire repair. The border stations are open May 15September 15 9 a.m. to 8 p.m. (Alaska time). Turn left at the junction to continue to Eagle. Fortymile River Bridge (Mile 112.6)Access to the South Fork Fortymile routea week or so from here to Eagle. Lodge with gas (Mile 125.4)Next gas station is in Eagle, Chicken, or Boundary. Ridgecrest (Mile 143.2)Enjoy the wonderful views. Eagle (Mile 160.3)Turn left at 4th Street for Fort Egbert, campground, airstrip, and BLM field office. Continue to Yukon River for businesses and walkabout (see Eagle, below).